If you are looking at campsites for boondocking near Yellowstone National Park, look no further than Henry’s Lake. Lakefront property, bathrooms, and a boat ramp make this site an ideal summer getaway location. Oh, and did we mention it’s a FREE campsite? Yeah, that’s just how we roll! The campsite we found near Yellowstone National Park was on the west side of the park, in a town called Island Park. The entrance you would use to get into the park is the West Yellowstone entrance. This is a very scenic area and gorgeous views all around. Check out our scenic drive around Yellowstone for awesome wildlife viewing! This campsite is off of a gravel road and is pretty easy to get to, even for big rigs. Off of Highway 20, you'll turn northeast on Highway 87 toward Island Park. After 5.1 miles, you'll turn southwest on Henry's Lake Drive, where the campground will be located 2.7 miles down. GPS Coordinates are provided at the bottom of this post. Once you get to the Frome Campgrounds, find a spot and pull in. Be sure to register, and leave a few dollars as a donation if you choose to. Otherwise, it’s a free campsite for all to use! This campsite is setup similar to a campground or RV park, with long, fairly level pads for each spot. The campground has a pit toilet bathroom as well as a boat ramp. This makes for a great area to launch your watercraft, or just watch the birds from the dock! 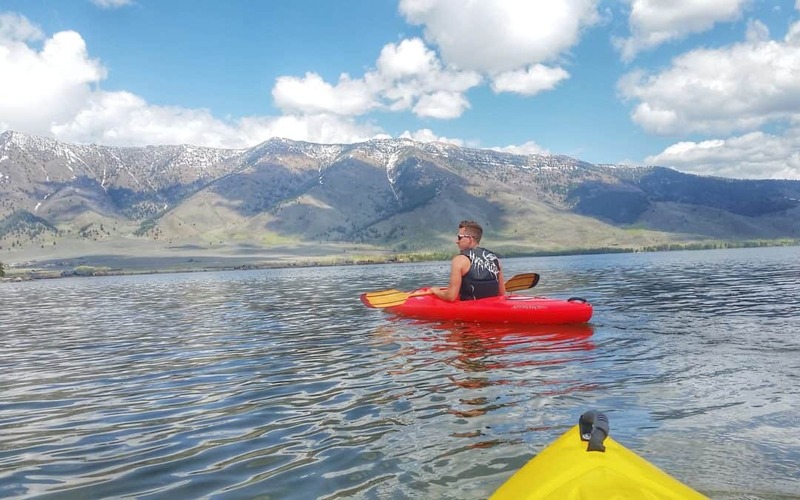 We paddled our kayaks around on the lake for a beautiful view of the area. The area is very quiet and makes for a nice base camp for activities around Yellowstone National Park. For a great free site for boondocking near Yellowstone National Park, you really can’t get much better than this. Although it’s a bit of a drive to the park, at least it’s a very scenic drive! Like campsites that are secluded but have hookups? Check out Wild Rose Resort and RV Park on Henry’s Lake! Prefer campgrounds that are a tad closer? 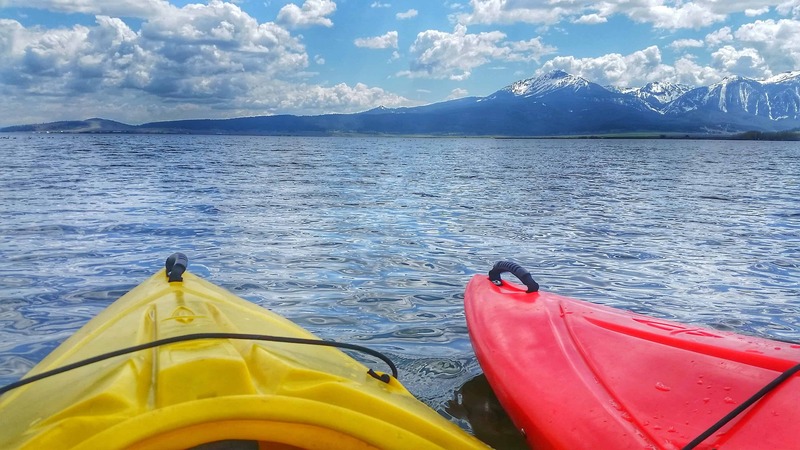 Madison Arm Resort and Campground is just outside the town of West Yellowstone! Want to be in town? 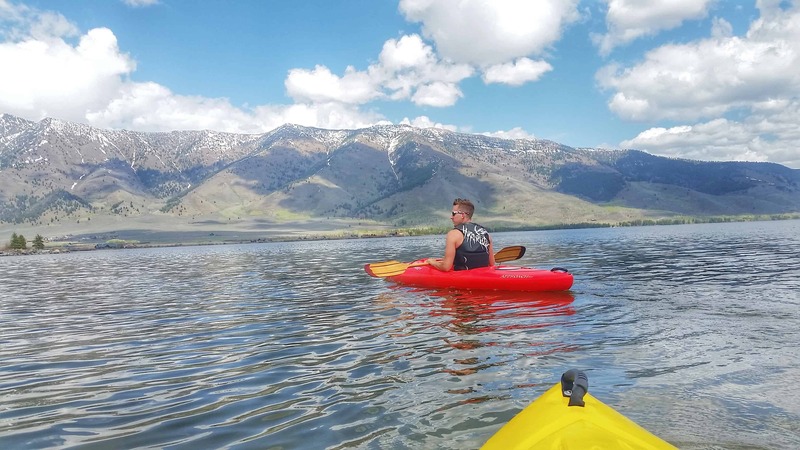 Yellowstone Cabins and RV Park is as close as you can get without being inside the park, and it also offers cabins for those without a camper/RV! For more boondocking campsites and other adventures, be sure to sure to subscribe to our page below and check us out on social media! Until next time, Live Vicariously! this is happening to them too? This might be a issue with my internet browser because I’ve had this happen before. Hi! I’m so sorry you were having problems. We had a website issue and are getting it fixed now. Thank you for letting me know!